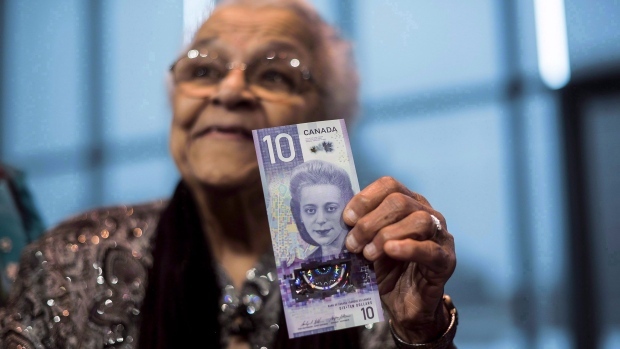 Wanda Robson still finds it hard to believe that her big sister is the new face of the $10 bill -- and the first Canadian woman to be featured on a regularly circulating banknote. The sister of the late Nova Scotia civil rights pioneer and businesswoman Viola Desmond, Robson said the move to include a black woman on the bill is a "giant step forward" in continuing Desmond's work toward equality. "I'm so grateful and I'm happy," said Robson, who turns 92 next month. "Those are sort of mundane words, but I'm looking for a word that would describe it, and all I can say is what the kids say today: it's awesome!" For her first purchase, Robson plans to buy a book co-written by her and Cape Breton University professor Graham Reynolds about Desmond's life and legacy, and give it to her 12-year-old granddaughter so she can learn more about her great-aunt's story. "She said, 'You know nan, when I get my first ten dollar bill with aunt Viola on it, I'm going to frame it, and put it on a wall, and never, ever spend it,"' Robson said. Robson has spent years educating children and adults alike about how her sister's case helped shine a light on Canada's burgeoning civil rights movement. She said the new bill's national circulation will lead to even more awareness about Desmond's story, and the wider issue of racial discrimination in Canada. "It's a giant step forward into knowledge about who we are, where we've been, and where we're going," she said. "There's still a lot of work to be done, and I really hope that this bill will get not only children, but adults, to say, 'who is that?' And then people will be able to pass on what Viola did and the amazing differences she made." Behind her portrait, the banknote also shows a map of Halifax's historic north end, home to one of Canada's oldest black communities and the area where Desmond grew up. In recognition of the bill launch, Halifax's North End Business Association is hosting "Celebrate Viola," a multi-day event from Wednesday to Sunday that will feature a roundtable discussion about the civil rights movement, an original musical about Desmond's life, and a tribute concert. The bill is the first vertically oriented banknote in Canada, and also includes a picture of the Canadian Museum for Human Rights, an excerpt from the Canadian Charter of Rights and Freedoms, and an eagle feather, which the Bank of Canada said represents the "ongoing journey toward recognizing rights and freedoms for Indigenous Peoples in Canada." Desmond has received numerous posthumous accolades, including having a Halifax Transit ferry named after her and receiving a star on Canada's Walk of Fame.